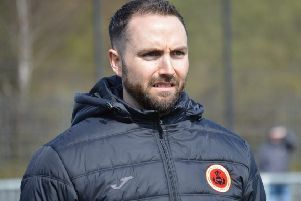 Rossvale returned to winning ways after their first league defeat with a fine win in the Scottish Junior Cup at Greenock. The second round tie was a repeat of the encounter between the sides at the same stage last season - and once again it was the Bishopbriggs side who prevailed. In a game where the ball was getting fired from one end of the park to the other it was Greenock who managed the first serious effort on goal in the 14th minute, but Adam Houlihan's back post header was put out for a corner by Jamie Donnelly. ‘Vale went straight up the park and nearly snatched the lead after Ryan Corr's passback to keeper Graeme Macrae was missed by the keeper and the ball went out for a corner. Gary Giffin fired the ball in to the back post where Peter Bradley narrowly headed past, much to the keeper's relief. Jamie Hunter thought he had put the Vale one up after 22 minutes but his lob was correctly ruled out for offside. Thomson tried to pull one back two minutes later with a thundering shot which flew past Donnelly’s upright. And Vale the went two up when man of the match Josh O’Hare received the ball at the edge of the box, steadied himself and fired in a tremendous shot which gave Macrae no chance. Greenock reduced the deficit in the first attack of the second half when they won a corner out after Donnelly's throw out to Bradley was intercepted and the resulting effort was turned behind. Glen Thomson fired over a deep cross which Ross Cameron stopped with his back to goal and turned to bury the ball in the Vale’s net. Rossvale went through a tough spell when they were finding it hard to get out of their own half and nearly paid for it when Derek Kennedy ran right through the middle of the defence and past Donnelly but the keeper was quickest to react and saved his shot. David Leadbetter had a shot turned over before Vale went further ahead just after the hour mark; Leadbetter found Andy Johnstone just inside the box and he turned to blast high into the net. Greenock pulled another back straight from the kick-off, Andrew McEwan beating several players before passing to Kennedy who had the easiest of chances to slip the ball past Donnelly from close in. Hunter could only watch in disbelief when his shot was saved on the line by the keeper but after a few changes by Gordon Moffat the Vale went further ahead. Johnstone had his legs taken away from him as he burst into the box and, with his first touch of the game, Liam Crichton sent the keeper the wrong way with the resulting penalty. Giffin then finished off a fine display two minutes from the end when he won the ball in midfield, beat a couple of defenders and fired in an unstoppable effort in off the underside of the bar.